I also did not say anything when I was tempted sometime ago, to advise our dear brother from Ile-Ife, to pray without ceasing because I see a foundational curse of public display of stupidity in his family. Though I never met his father, what I read about him reeks of foolishness and if the saying: “like father, like son” is right, then he has truly beaten his father to the record. It will be destructive for any of his offspring to tread that path, for this generation of ours does not tolerate laxity (I am trying to be under some restraint). I hope you know that brother from Ile-Ife? When I watched those two addresses in the press about a fortnight ago in the wake of Osun Elections, I said to myself, ‘a two-man-folly-gang’. I only pointed those two scenarios out of many so that you can see I have tried fighting this temptation long enough by going apolitical on my column for some weeks now. Giving a name from Saintdom to a child does not necessarily mean that child will live up to the responsibility of the first bearer of that name. For example, we will never find another Solomon in this life again (1 King 3:11-13). Also, there can never be a man that is as humble and supportive as Brother Jonathan of the bible era. Jonathan, the son of Saul was a great man. The very first time he came in contact with David, he gravitated towards him as he saw the mighty hand of God upon his life. Even when Saul, his father saw David as a great threat to him, Jonathan never had any issue with his good friend David; instead he was one of those that organized David’s escape out of the reach of his wicked father. His father was greedy, but never did we read that Jonathan was complicit to his father’s wantonness. Need I tell you that he was a quintessential statesman and a defender of his territory? Background check on him gives an account of opulence from his birth all through to his death. The bible provides more detail about this particular Jonathan, read the accounts of I Samuel all through to II Kings in the bible to understand more about this pure Jonathan. When the Israelites clamored for a King to rule over them, Prophet Samuel consulted God and God told them that the king that will rule over them will reign ruthlessly, but the obstinate Israelites said they wanted a King all the same; God yielded to their demand and Israel under Saul was a story of woes. Same goes for us. When we had the “cabal” hold on to power after the demise of Shehu Musa Yar’adua, we all went to the streets protesting that Goodluck be sworn in as stipulated by the Constitution. No doubt we all upheld the Constitution, but we must also know that God was telling us something that none of us took time to understand; perhaps God was telling us that the interior of this façade you see is full of worms, but we held on to that which was constitutional. The saying; ‘the fact that it is rational does not make it right is always true. Otherwise, how can we describe a ‘gentleman’ that has a strong penchant for odious corruption and attenuate such as mere pilfering? The direct scion of Saul would have been forgiven if he uttered such a statement, but eons later, Sauline spirit has berthed in Aso Rock and upon a namesake of his first son. As the Yorubas will say: Epo epa lo jo posi eriri, that is to say, compare likes with likes. To decipher this our Jonathan, one does not need books to be consulted, just as one of those ads for TAN by Chief Zebrudaya put it; one does not need a mirror to look at what one has in his/her palm. “Fly like a butterfly, sting like a bee” is a wiseacre from that renowned heavyweight boxing champion of history, Mohammed Ali. Our Jonathan could be likened to that as he presents the mien of a gentleman but is more callous and brutal than many Abachas combined. This Jonathan uses state apparatuses to demasculinize his people. The bible Jonathan never compared himself to David, or any other person, as he lived his life as God ordained it. He lived and fulfilled his destiny, but this Jonathan is so over ambitious to the point that he is ready to sacrifice the soul of this nation on the altar of bigotry, just for him to remain in position of authority which he is grossly abusing anyway. Nothing is wrong with being ambitious but when you start to compare yourself shoulder-to-shoulder with people whose shoe’s laces you cannot untie, it is obvious that such ambition will end in peril. If not for the blind obstinacy of the Israelites, Saul would not have come near the throne; if not for our crude political-scope, this Jonathan would not come near a Local Government Chair. Jonathan in the bible fought and died gallantly, defending his territory against insurrection. He died a hero. But I do not know, with all the sophistication of modern technology and international assistance that this our dear brother has, why he is still finding it so difficult to marshal this nation aright and bring this insurgence we are faced with to a reasonable reduction. Rather, he has a readymade alibi that this is just our own share of global unrest. Jo, fight like a man! 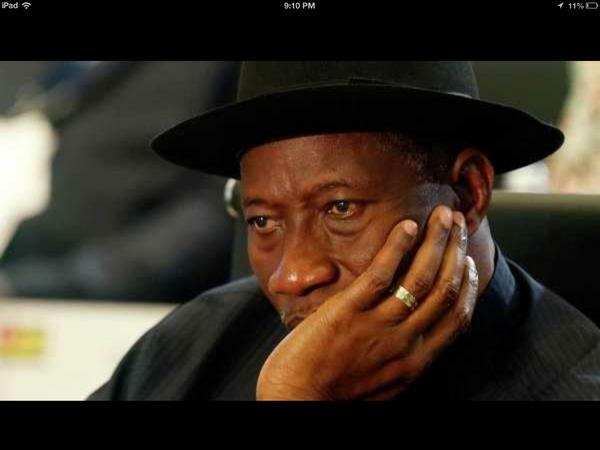 This Jonathan is bibulous, unlike the bible Jonathan. No account was given of Brother Jonathan engaging in a frenzy with anyone but this our present day Jonathan speaks from the two sides of his mouth on the account of excessive intake of HOLY WATER. I need not tell you how he went disgracing the nation at the Fiftieth Anniversary of the AU, when he could not address the Summit on account of his inebriation. Jonathan, the son of Saul had a strong virtue of patience, which made him qualify as one of the noblemen of his time; but even when our own Jonathan’s Patience starts with a capital letter, she is a burden to his household as well as to the nation. If Jonathan could befriend such a wise man as David, it shows he had himself surrounded with wise counselors; but we have a sharp antithesis in our dear brother Jo: he seeks counsel from mudslingers and high-rated debauched individuals. For want of space, I may continue this sometime later but permit me to say that when King David remembered his good friend Jonathan, he asked that someone should look for anyone that is remaining in the house of Saul so that he can recompense the good deeds of Jonathan. On that account, Jonathan’s son, Mephibosheth, who was a lame, was brought to dine with the King thence from (2nd Sam 9:3-13). I do not think history will remember this Jonathan for good. What is news about any Nigerian politician? That a man chose to peg his tent with “pilferers” should not make us cry foul. After all, it was corruption he fought not stealing.